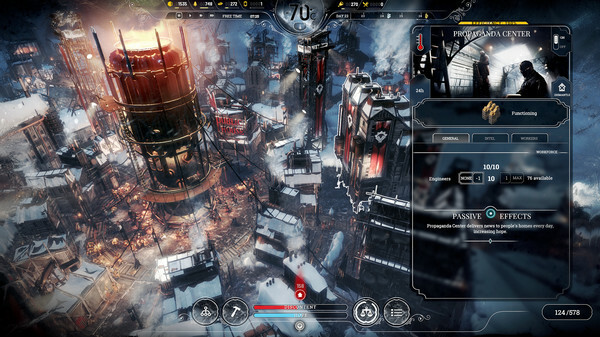 Coined as a "society survival" game by 11 bit studios, Frostpunk is a unique evolution of the city-building/management genre and is set in the frozen wastes of a broken Earth. 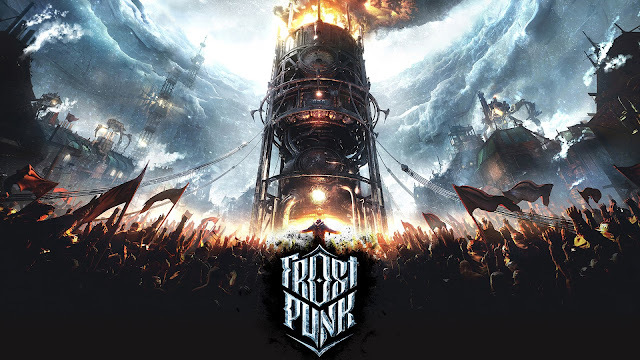 Brutally challenging yet extremely satisfying, Frostpunk will challenge every fiber of your managerial being… and you will love it. Set after the decline of humanity and during the onset of a new Ice age, Frostpunk spins a tail of survival mixed with the brutal reality of a people worn down by mother Earth as they simply try to survive. You will be tested, you will be tried, and you will fail. Then you will pick it up and try again. Frostpunk sets a blazingly-high bar in a new genre of PC gaming, and any future competition will be pale in comparison. The most startling aspect of Frostpunk that you will find when loading into it is how flat the color palette is. In many games, a high-contrast blue/white palette cannot be pulled off with any real interest, however the aesthetic of the various buildings (which are Victorian-Steampunk) that you can build and upgrade manage to somehow just work in Frostpunk. Many games that stick to a specific color palette can quite dull (see: Diablo III, Quake) and at first I was concerned that this would happen to Frostpunk, however after dozens of hours in game I am still not sick or board of the way the game looks. FrostPunk is brutally challenging and incredibly rewarding. Few titles are capable of truly stressing someone out but 11 bit studios really outdid themselves here. It may sound odd and a bit cliched, but Frostpunk is the Demons Souls of society/city-building survival games, except it is gathering significantly higher acclaim than the oft-overlooked From Software title. 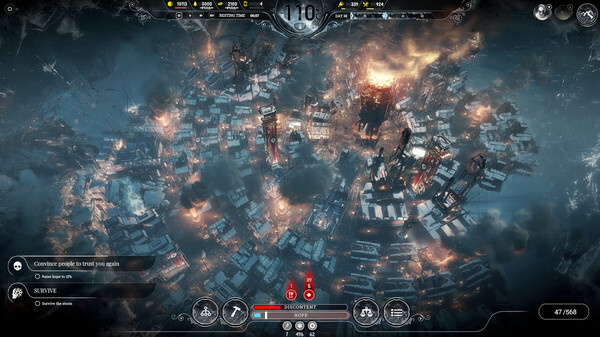 What I find most interesting is that standard survival city-building games like Banished feel far less strategy-oriented, whereas FrostPunk is chalk-full strategic managing … and it is quick. If you are not on top of your game, activating/deactivating buildings, reassigning civilians (or children! ), managing your law book, and exploring/scouting the frozen tundra, then you will fail. In fact, even if you are on top of your game, you will fail. 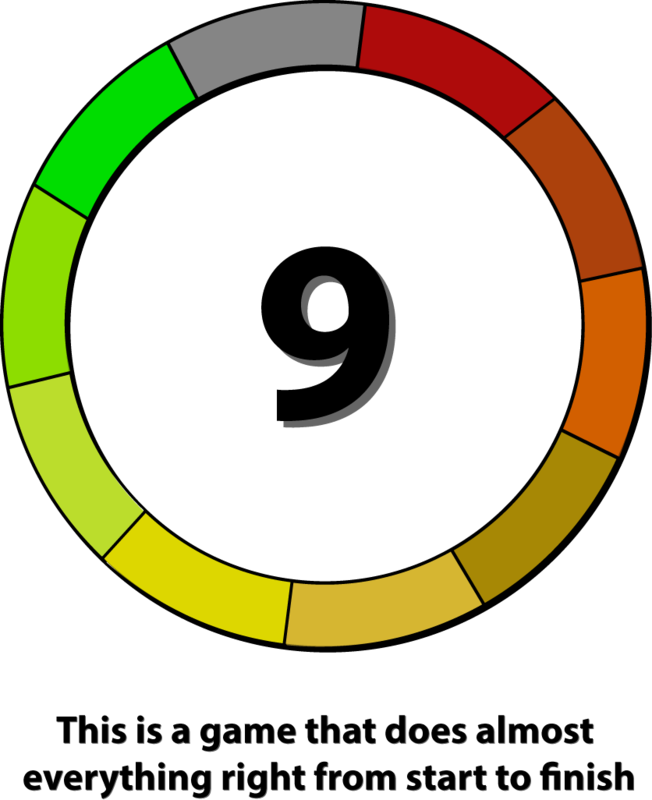 Expect to be banished at least a dozen times before you get into the groove of things and figure out a solid workflow. The exciting part is that no two playthroughs will be the same; sure the milestones will be the same, but cold snaps? Yeah, they will vary… and they will kill your populace if you are not ready for it. The key is to work to solve the next cold snap, not the current one. If you are pushing your generator to the limit on the current cold snap, you are nearly guaranteed to hit game over; trust me, always work towards your next goal. With dozens of different selections for technology research, an interesting and almost living personality to your city, and heaps of frozen trouble, FrostPunk will challenge every fiber of your strategic being and it. is. glorious. I am not entirely sure I can adequately define the addictive brutality found in FrostPunk as it is genius in its drive to freeze you out. 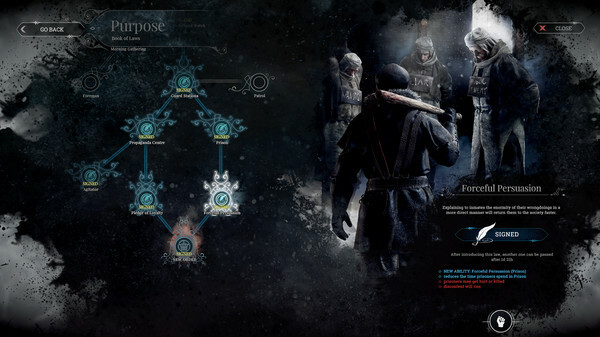 FrostPunk is worth your time on every level … the visceral struggle of a lost people working their way through the frozen tundra is incredibly relatable and it is terrifying. With the steampunk aesthetic, eerie music, and talkative populace, FrostPunk pulls you in and holds you in place as you work your civilization to near-death as you hope to survive the end of the world. Survival is not easy but if you can survive, your sense of accomplishment will be monumental.